2017 Annual Enterprising Women of the Year Awards Celebration and Conference – Kicking off on the evening of Sunday, April 2nd and lasting to April 4th at the Ritz Carlton i n Fort Lauderdale, the Enterprising Women Foundation is celebrating the importance of women leaders and mentorship. The conference will be hosting outstanding high school girls all across the US for two days of leadership training and one-on-one mentoring. Alka will be participating as one of the key speakers on the STEM panel, highlighting her commitment in empowering and inspiring the youth to pursue entrepreneurship and careers in science and technology. Alka will also be speaking on the OM Factor with a book signing to follow. To register and learn more about the conference, click here. Washington Women’ Leadership Initiative – Join us for a seated luncheon with Alka Dhillon on February 23rd at the Westwood Country Club. Alka will be speaking on Mindful Leadership along with some of the conerstone principals of The OM Factor that can be applied practically and in the moment. Click here to register and here to learn more about the event. Million Women Mentors Summit–On October 24, Alka Dhillon joined MWM and STEMConnector in pledging to help and reach a million mentors (male and female) to support girls and women engaged in careers in STEM. Alka also participates in a panel among 5 other influential women leaders in which she spoke about the importance of mentorship. Click here to read more about the summit. – Morgan Stanley features Alka Dhillon as the spotlight speaker on October 21st at their Moms at Work Luncheon. Women often find themselves caught in a never-ending battle of conflicting interests. Alka speaks about tools to help all women integrate the disparate aspects of their lives. Alka is is honored to speak with Morgan Stanley’s #momsatwork group and a firm believer of their message in uplifting and supporting women to pursue leadership roles, all the while finding their inner balance. WOMEN’S ECONOMIC FORUM (NEW DELHI, INDIA) – The Women’s E conomic Forum have conveyed the global “Technology and Innovation Leaders of the Decade” award to Alka Dhillon. She will also partake in a panel discussion speaking on the world of technology and innovation, sharing how her work professionally and personally is influencing innovation for the future and shaping new generations, as well as do a session on The OM Factor. The conference will be held in New Delhi, India from May 16-21, 2016. More information about the organization and the program can be found at http://www.wef.org.in/ and http://www.wef.org.in/wef-2016. Learn more about the movement, watch the video, and see the pictures. 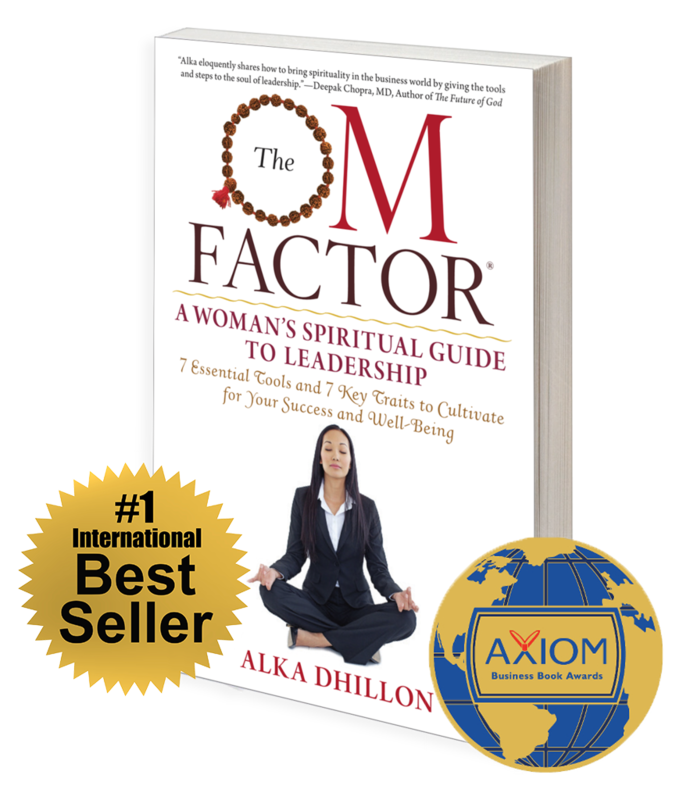 AXIOM AWARDS (CHICAGO,IL)– On May 11, 2016, Alka received the Bronze Medal Award as one of the best business books of 2016 in North America for The OM Factor. MIRAVAL RESORTS (TUCSON, AZ)– Alka will be sharing the practice of cultivation of one’s deepest desires through meditation and the art of active meditation to overcome feelings of powerlessness. The talk will take place at the Miraval Resorts on May 4, 2016 from 6:00-6:45 p.m. MINDFUL FITNESS FESTIVAL (HIGHLANDS, NJ) – http://mindfulfestival.com/mindfulevents/ Alka is scheduled to do a one hour workshop during this weekend long event in September. The family fitness festival runs from Saturday, September 12 and Sunday, September 13. The event will be at The Loft at 600 F in Washington, D.C.: http://theloftat600f.com/ There will be a book signing following. AT&T/ WIT LEADERSHIP LUNCH MARYLAND : Alka will be the keynote speaker on September 24 from noon-1pm at their Leadership Luncheon at the A&T offices in Hanover, Maryland. There will be a book signing following. CACI (ALEXANDRIA, VA) – www.caci.com Alka will do a one hour workshop for CACI on September 30 at 1 p.m. ET. CACI provides information solutions and services in support of national security missions and government transformation for Intelligence, Defense, and Federal Civilian customers. A Fortune magazine World’s Most Admired Company in the IT Services industry, CACI is a member of the Fortune 1000 Largest Companies, the Russell 2000 Index, and the S&P SmallCap 600 Index. CACI provides dynamic careers for over 16,700 employees in 120 offices worldwide.